Our “bare” welder is for those railroad enthusiasts who want to build and landscape their own scene. 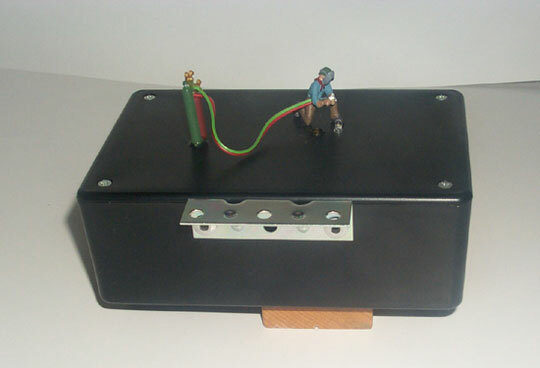 It consists of a plastic enclosure that measures 4” x 6” and includes a welder figure with an oxy-acetylene rig or an electric arc welder rig. A built-in speaker with volume control and our authentic arc welding light and sounds synchronized together make a great effect on your layout. With our “smoke” unit effect and you have an instant and realistic welding scene. Install it in any factory, building or “yard. A screw terminal strip allows for easy connection and a bracket allows you to install this quickly with a couple of screws. This animation includes smoke and full instructions. The animation operates on 9-18 volts AC for the arc and sound effects and 14 volts AC for the smoke unit. Specify gas or electric welding rig. The sounds are the same for both and are an electric arc sound.